18lbs Valve springs, These are a MUST have for when reving over 3600RPM's. These springs are capable of reving to 6500 RPM. 26Lb Valve Springs for GX200 & GX160 engines. Ideal for 13-18Hp Engines. Must use our stainless steel valves, small diametre Aluminium Retainer & Split Keeper set for reliability. Upto 8500Rpm's. 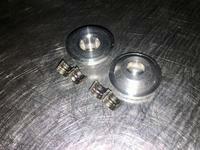 Valve Spring Shim for GX160 & GX200 engines. .030'' thick. Easy way to increase spring pressure. Works well with 26Lb Valve Springs. Retainer & Keeper Set, designed for stainless steel valves. Includes two retainers and four keepers. Complete set for two valves. The stock retainer setup was designed for 3600 rpm. This retainer and keeper utilizes the same design used on race cars. Recommened for all high HP & RPM applications. Use these for 18Lb & 26Lb Valve Springs. Stainless Steel 24mm Valve. Same size and length as the stock valves. Undercut for high flow, Micro polished stem, Lighter and stronger than stock valves. Use with our 26Lb Springs with our Aluminium Retainer & Keeper Set or Dual Valve Spring Kit. Must use lash caps. 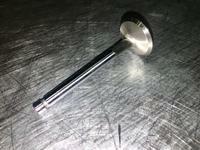 Stainless Steel 25mm Valve. Same size and length as the stock valves. Undercut for high flow, Micro polished stem, Lighter and stronger than stock valves. Use with our 26Lb Springs with our Aluminium Retainer & Keeper Set or Dual Valve Spring Kit. Must use lash caps. Stainless Steel 27mm Valve. Undercut for high flow, Micro polished stem, Lighter and stronger than stock valves. Use with our 26Lb Springs with our Aluminium Retainer & Keeper Set or Dual Valve Spring Kit. Must use lash caps. Stainless Steel 28mm Valve. Same length as stock valves. Undercut for high flow, Micro polished stem, Lighter and stronger than stock valves. Use with our 26Lb Springs with our Aluminium Retainer & Keeper Set or Dual Valve Spring Kit. Must use lash caps.